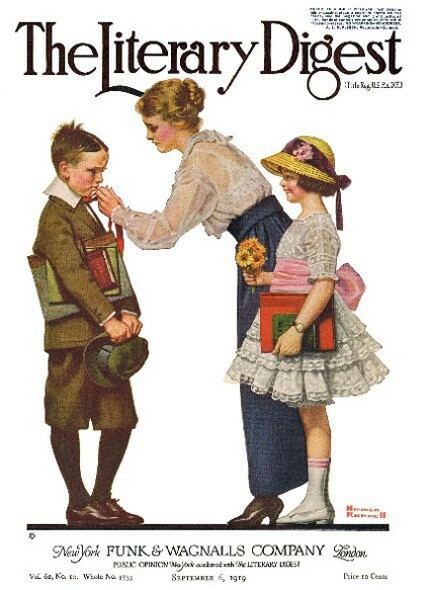 Mother Sending Children Off to School, this Norman Rockwell painting, appeared on the cover of The Literary Digest published September 6, 1919. The Digest featured Rockwell's artwork on its cover a total of eight times in 1919. This painting was Rockwell's ninth picture gracing the cover of The Literary Digest. This painting also appears on page 50 of Norman Rockwell, A Definitive Catalogue by Laurie Norton Moffatt. The original oil on canvas painting, 27 x 24.125 inches or 68.5 x 61 cm, is part of a private collection. Norman Rockwell knows that it's back to school time. The topical nature of his works reminded his viewers that he was, at heart, one of them. Mother Sending Children Off to School was only one of 47 Norman Rockwell Literary Digest covers; here is the list of more Norman Rockwell Literary Digest scans. Mother is proudly getting her two children ready to leave for school. She has a serious look on her face. Her little girl is just beaming. She has a bouquet of flowers for teacher. She is wearing a bonnet and a pretty white dress with a pink sash. Yes, little Sister is ready for school to start. Mother's little boy is another story. He too is dressed nicely for school, wearing a nice suit with short pants, knee socks and sined shoes. He, in contrast to his sister, doesn't appear very excited or eager about going to school. He has a grim look on his face. Let's hope school is better than little Brother thinks it will be.